New name no double account . That's your answer, ignore bullies. Lately I have been listening to Regine Crespin's recording of "Les Nuits d'ete" and the Ravel Sheherezade" with Ansermet conducting. Absolutely beautiful! Crespin's unique voice is perfect in this repertory. Highly recommended! thank you. I snapped up Magdalena Kozena’s first recital disc of Bach arias, I enjoyed it, but subsequently could not get much out of her disc of Mozart, Gluck and Myslivecek. It was many years until I heard and saw her in Rattle’s Berlin St Matthew and suddenly the voice clicked with me. There is the Melisande, again for Rattle and recently I have been buying her discs at bargain price. I think this one is the pick of them so far. The voice sits between soprano and mezzo. On this disc she sings Sesto in Giulio Cesare, on another disc she sings Cleopatra. Likewise here she ranges between the mezzo and soprano roles. The voice is limpid, like seeing sunshine through amber. She is unafraid to make ugly sounds when she feels they are warranted. She sustains attention and uses silences intelligently in a long aching aria from Alcina and throws off Had I Jubal’s Lyre, Ariodante, Orlando, Hercules, Rinaldo and others. Most are well trod but here, far from hackneyed. The accompaniment is anything but routine, lovely tenderness from them and muscular playing where appropriate. It hangs together well as a program, one of the best Handel discs I own. I especially love these songs in full orchestral dress and they lose colour when the setting is the piano alone. There is always an exception to such rules, and this is it. These two musicians have a remarkable symbiotic partnership and the piano is so exceptionally expressive and full of colour that for the space of the disc, I simply don’t miss the orchestra at all. In a detailed programme note Gerhaher explains that most of the songs were created with piano accompaniment, then some were orchestrated. A few years ago I eagerly awaited a Mahler concert which included the Ruckert, sung by Gerhaher. However I did not really hear him. For an Albert Hall prom he decided to adopt a whispered parlando and he was all but inaudible from where I sat. However, this disc was set down several years before that event and he had not started to experiment with his non-singing in huge hall phase. I have read this complaint about another of his concerts. The sung legato is magical. He smooths out the supposedly expressive bumps we normally get in Ich bin der welt, yet it remains very expressive, the legato spun like silk. The moments of gentle inwardness are safely caught for us by the engineers. He has the chops for the big moments and does not underplay them. Gerhaher’s way with text reminds me of Schwarzkopf, who can sing conversationally, telling a tiny story rather than PROJECTING the words. He also has developed this skill, and as I indicated, the partnership with Huber is very special and provides a disc I know I will come back to over and over. Couldn't agree more, Mike. It's a stupendous collection. Her "Dopo Notte" on this disc is electrifying - pure air-punching joy, and a perfect proof of my contention that Handel invented rock and roll. Very good Alan, great Youtube clip. If you think you can get on with Pelleas et Melisande, I recommend it. She is not the usual passive, fey character and the beaurt that Rattle draws from the orchestra is intoxicating. I've been a little put off Kozena after hearing her at a concert which also featured David Daniels. I can't remember the exact details, music of the Baroque, a mixture of duets, solos and orchestral works. Daniels was his usual communicative self, attempting to also connect with his partner during the duets, but she was quite blank and I don't think she even looked at him once. There was no denying the quality of the voice, but she came across as terribly dour and rather dull. There was no joy in the music making. It did put me off her and I haven't really listened to her since. Maybe it's time I rectified that. Maybe she was just having an off night. I too am partial to the Mahler songs in their orchestral guise, but when performed as Gerhaher and Huber did, there’s a poignancy, a delicacy and a purity and makes one not regret the orchestral versions. The recital will remain in my memory for as long as I live (or retain my mental capabilities ), and the CD is an excellent reflection of it. I have had mixed experiences of her. I know what you mean about being blank. She sang a very cool, detached Scherezade at the proms this year, she was certainly strained at the top of her range. I saw her do the mezzo solo in Berlioz Romeo and Juliet. It probably lasts about six minutes. She used a score, which I thought showed she was not really bothering to prepare, then sang into it and ignored everyone. I tend not to enjoy watching her. She has a stiff stance and the facial expressions can look painful with her gaze into some invisible middle distance. But there is some good singing going on and Bach, Handel and Vivaldi seem to suit her. What a superb experience. He is a very intelligent singer, but is careful not to get too cerebral. He really communicates. I have a number of his early discs in partnership with Huber and I have reviewed several here including the Nachtviolin disc. I would love to hear him live, but in the right venue, and the right music. He is in the Rattle St Matthew CD from Berlin. That performance is altogether extraordinary. He sings Christ and perhaps due to his placing, separate from everyone else, he makes very little impact. I gather his live Wagner is excellent. Buy, buy, buy. This is the best recital by a young singer that I have heard in a very long time. Dreisig is approaching her middle 20s and has been winning awards. This is her first recital and as far as I can see, her first recording. There is a concept, the miroirs provide us with characters as conveyed by two different composers for Juliette, Rosina, Salome etc. However, despite the storylines, is Rossini’s Rosina anything like the Countess Mozart conveys? I don’t really find the juxtapositions work as an idea, musically, no problem. Here we get sensational, spectacular singing and insights into the characters. Dreisig is, I think, half French, so the French sounds native and the culmination of the disc is the final scene of Strauss’s Salome in Strauss’s French adaptation. I can’t imagine this going better than here. The voice rides over the orchestra where it needs to and there is plenty beautiful gentle, sensuous singing. The disc price is easily worth this track. I would love to hear these artists in the whole piece. I do not get along with the Nagano French edition because of Nagano’s flaccid approach and the uningratiating Salome. The Rossini Una voce has a real freshness and humour to it, the technique is first rate. Thais and Faust’s Margaritte are paired because of their contemplations gazing into mirrors, as I say, ignore all that, the arias get first rate performances. 70 minutes of this singer was not enough, it quickly became 140, I look forward to more. Dreisig goes on my wishlist. Thank you for the review, knight66! I listened on Spotify today, Mike, and I agree with you. It's a long time since I've listened to a recital on which the singer characterises so well. It will be interesting to watch her career. She seems to be taking it quite slowly so far. She's singing Manon (in the Massenet opera) and Elvira in I Puritani next year, and debuting Gilda in 2020. I'll third that sentiment! I got a free 3-month trial to Amazon Music Unlimited with a recent order, and the Dreisig album is available on it. She's also on a couple of tracks from guitarist Thibaut Garcia's disc Bach Inspirations, where she joins him for the Bach/Gounod Ave Maria and the aria from Bachianas brasileiras No. 5. Thanks guys, I remain as enthusiastic after a number of hearings. Panting for more basically. Thanks from me too. The bits I heard sounded pretty awesome. 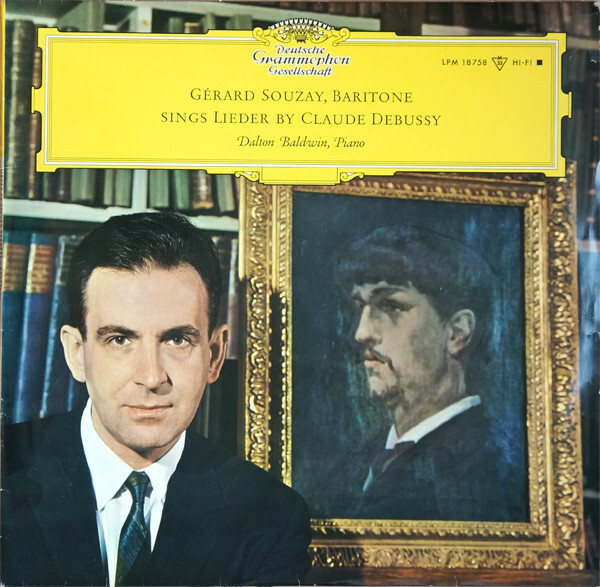 I was wondering whether or not you or other fellow opera and vocal enthusiasts knew if a label (or more than one) have released on CD Souzay's album of operatic arias? I quite enjoyed listening to it the other day--though the LP wasn't in the best of shape alas. I also would love to get ahold of his Bach recordings and am wondering about that too (regarding both LP and CD formats). p.s. Mirror Image: looking forward to finding a copy of your album! Fingers crossed anyway. I hve so many recital records. Many of them are listened to once and never again, so I've decided to revisit them all again, and assess how many are worth keeping. This is one I certainly won't be getting rid of, unless I decide to buy DG's issue, which is of the whole Edinburgh recital. This one is only part of it, plus some tracks that were recorded in Salzburg the previous year. These are the last notes ever recorded by Fritz Wunderlich. Two weeks later he fell from a stairway in a friend's country house due to carelessly tied shoes. Thus a freak accident deprived the world of one of the greatest lyric tenors of the twentieth century. He was a couple of weeks short of his 36th birthday and at the height of his powers. Wunderlich was unusual, if not unique, among German tenors in that his impeccable legato remained in tact no matter what language he was singing in. Indeed his recordings of arias by Verdi and Puccini, though mostly sung in German, have an Italianate ardour and passion that would be the envy of many a native Italian tenor. Some have complained that this very ease of emission and beauty of tone act against him when he is singing lieder and his commercial recordings of the same repertoire as at this concert (recorded the previous year for DG) do lack a certain sense of involvement. There is a world of difference between those studio recordings and this concert however, Wunderlich has now thought himself into the plight of the man depicted in the Dichterliebe and here we have all the pain and suffering of a young man. Surely what Heine and Schumann intended. And of course we still have the benefit of that glorious, golden tone. Unfortunately, as in the studio, his performance is rather let down by the somewhat prosaic playing of Hubert Giesen. To bad he never worked with Gerald Moore. Nevertheless this is a treasurable memento of a historic occasion and as such should be in any serious collection of vocal music, if you can still find it anywhere, that is. I believe DG also issued the concert at some point, and that may be easier to find. We are left to wonder what wonders he would have achieved had he not been taken from us so young. Whom the Gods loved indeed. Wunderlich is a favourite of mine, though not usually for song. His Lenski aria is my favourite despite it being in German. It is such a pity that there is not a lot more of his work left to us. I recall reading that Wunderlich died in between sessions for Karajan’s Haydn Creation, which then required a substitute tenor to be engaged for the recits he was yet to record.